The country’s prime minister has called for an immediate investigation. A helicopter crashed outside Kuala Lumpur this weekend, killing all six people on board including Malaysia’s former ambassador to the United States and an aide to Prime Minister Najib Razak. Malaysian national news agency Bernama reported that an eyewitness had said the helicopter burst into flames at around 4:55 p.m. local time before crashing in a rubber plantation in the town of Semenyih. The rescue team has since found all six bodies. Amongst the passengers was a minister of parliament and former ambassador to the United States, Jamaluddin Jarjis, who had played an important role in boosting U.S.-Malaysia relations first as ambassador and then as special envoy to Washington. Others included Azlin Alias, the principal private secretary in the Prime Minister’s office. Local media indicated that the group was returning from the wedding of Najib’s daughter in Kuantan. At a press conference, Najib said that this came as a big loss since both Jamaluddin, who he had known well since his university days, and Azlin, who he described as his “Chief of Staff,” were close to him. He expressed his condolences to their families and praised their contributions. “The contributions of these two men to the government, to UMNO and to Malaysia were very significant. 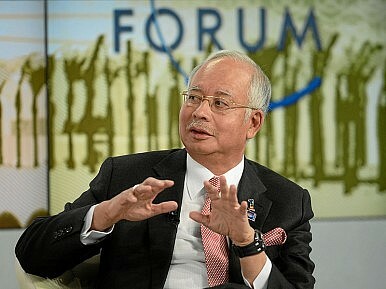 Theirs was an example of national service that we should all emulate,” Najib said. Meanwhile, Transport Minister Liow Tiong Tai said the Department of Civil Aviation had initiated an investigation which would include retrieving and examining all related evidence, including the cockpit recorder in the helicopter. Why the GST Became Malaysia's Public Enemy Number OneMalaysia’s China Policy: The More Things Change…Mahathir Sets New Course for Malaysia in First 100 DaysMalaysia and Australia: New Focus on an Old ScandalWhat Does Malaysia’s Earthquake Election Mean for Democracy in Southeast Asia?